Directed by David Anspaugh, and starring Sean Astin in the leading role, Rudy tells the true story of a young man realizing his only true dream - to be a part of the Notre Dame football team. With a message saying that nothing is impossible if you just try hard enough, Rudy is an emotional, feel good drama, which succeeds in telling its story mostly thanks to Jerry Goldsmith's effective music. 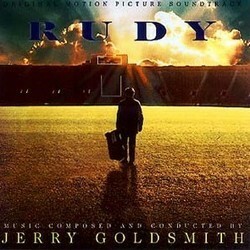 Rudy may very well be one of the composers' finest and most attractive scores ever. With the help of the full symphony orchestra, augmented by piano and subtle choir, Goldsmith paints a beautiful musical landscape filled with lush strings, soft woodwinds, upbeat brass and wonderful themes. Goldsmith opens the score, and the soundtrack, with a lyrical theme, with roots in Irish music. It has a very wistfull quality that is both joyfull and sad at the same time. It may get a little too cute at times - especially when the soft choir and the strings kick in, but who cares... It's beautiful, memorable and incredibly effective in the film. The other major theme is a wonderful and upbeat ditty. It is first presented in track 3, "Waiting", by a lighth, playfull oboe, soon followed by the entire orchestra, and a wonderful, strong French horn solo, and shows up again in a couple of other cues, but most notably in "The Final Game". Building to a glorious finale, this is one of the best moments in both score and film. To be honest I started to cry at this point when watching the film, and all thanks to Goldsmith's amazing music. The only negative I can think of to say about this score is that it perhaps is a little repetetive - most of the score revolves around the two major themes - but with such beautiful themes and orchestrations, I don't really mind. With a running time of around 35 minutes the CD is neither too short or long. The booklet includes plenty of pictures of Goldsmith at the recording sessions, and some short paragraphs by the director and the real Rudy. This is an immensely enjoyable score from Goldsmith and is free of bombast even though there is some action mixed in. The main theme is lyrical and pleasant, albeit somewhat sentimental. The entire score is like that really. A lot of it brings memories of Forrest Gump and indeed many of Gump's themes seem to bear a striking resemblance to those from Rudy. The overall effect is just as sugary. Fortunately for Goldsmith, he gets more time to expand theme themes unlike in Gump where the tune will start and then it's the end of the track. There isn't a great deal of variety to the score, it has to be said. Aside from the main theme, there is a quicker moving theme that is mostly used to support the football scenes that appear in the film. The only thing I wonder about this theme is that it's not quite as kinetic as I would imagine. The end track, especially, I expected to be much more exciting. Everyone raves about that track (including all those at the recording with stories of bursting into tears and applauding - all very melodramatic and difficult to see why as well). The problem with The Final Game is that it starts reasonably quietly, builds a bit, but the plateau seems to be a bit low in terms of energy. I hoped for it to be desperately exciting, but was a little disappointed. Still, this is an enjoyable score that fans of Gump, at least, will like and it's nice to hear something by Jerry that isn't all loud action cues.